Hephesto's Forge: A pirate's life for me? Good day everybody, back after another busy couple of weeks. I won't bore you all too much, but simply put somebody at the universy where I work has done a lot of damage for a long time that has and will continue to have a profound impact on a lot of people. So lots of meetings, damage controle, media nonsense and general nastiness. 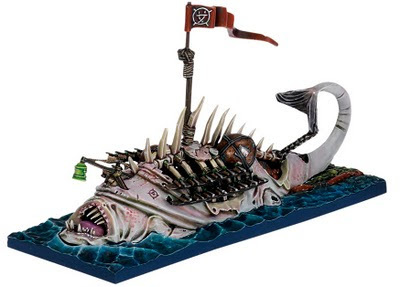 So Games Workshop's pre-order of Dreadfleet makes for a very nice diversion/topic to have a look at. In this post I'll be going through the minis, gamesystem & rules and approach to their second limited edition (board)game. Dreadfleet is a full, out of the box game for two or more players in which the gamers take on the role of two mighty fleets sailing the grand seas surrounding the damned port of Sartosa. The box contains two fleets, first the Dreadfleet which is an alliance of undead and general evil races such as Skaven and Chaos Dwarfs under the command of the Vampire Lord Noctilus. 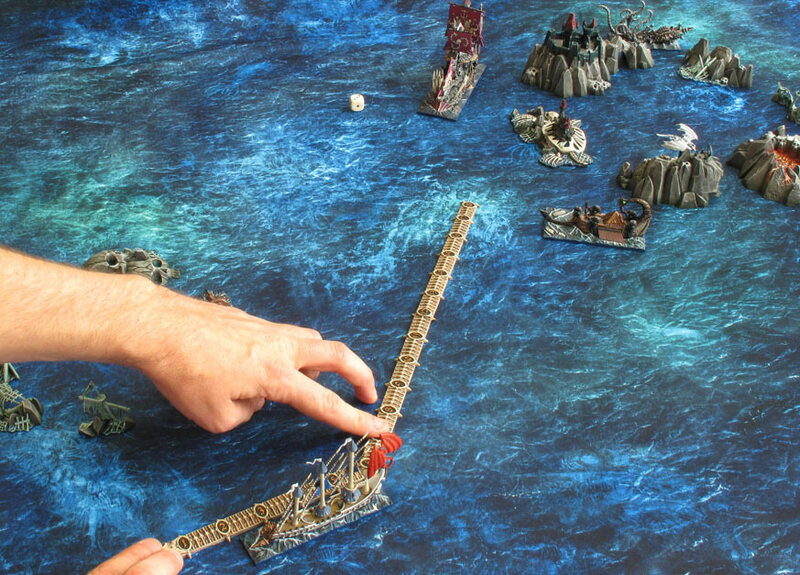 While the grand alliance set out to destroy them is lead by captain Jaego Roth and includes a mothly mix of Dwarfs, Elves, Sartosa Pirates and even an Arabian-born Golden Magus. 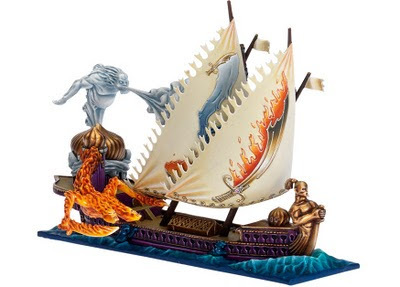 Nice, sleak ship design, focusing on elemental magicks and Araby, a mostly ingored region in the Warhammer world. At the same time I can seriously understand that this may not work for a lot of gamers. Both the over the top-designs and the mixed fleets do not really help convince people who are on the fence about this release. Which brings me to the next issue, the box' cost. At 70 quid this is quite a costly game, though costly is of course a relative term. Just have a look at some of Fantasy Flight Games boxed boardgames. Still, for those 70 quid you do get a clot map, 10 large ships, 6 support vessels, 3 monsters and a series of islands and wrecks. 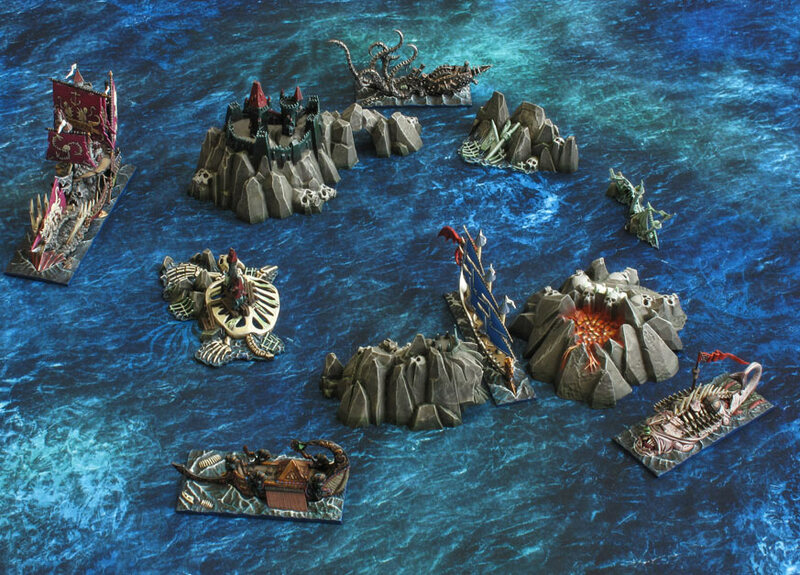 In fact looking at the sprues and contents I see only a single odd decision; the sea-textured bases. On the one hand I really like these as they make movement etc a lot easier and certainly add to the fleet of the ships. 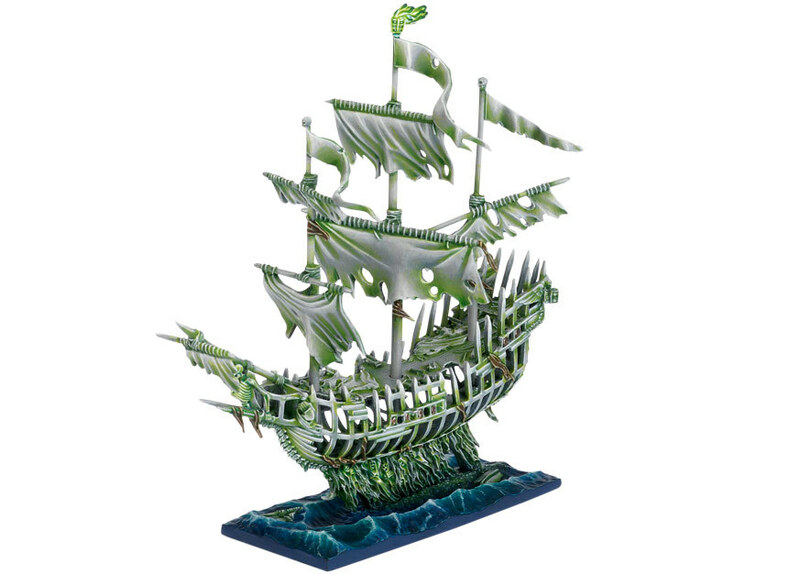 At the same time a series of standard bases would have freed up almost an entire sprue, which could have translated into 2-4 extra, large ships. Next up we have, for me at least, the biggest problem for this game so far - the actual game. Up and until two hours ago there was zero information on the rule system for this game. Save for looking at the rules and wind gauge included on the miniature sprues and a few quotes in a rather fun intro video we had nothing to work with. So eventhough I really like the look of the miniatures, there is no way to determine whether or not it will actually be any fun, how much time it will take, if there are different scenarios and if there is scope for fan-made extensions. Finally we have the limited edition-approach GW has taken with this game. I realize that it both helps to create more buzz by suggesting (fictional?) scarcity and also allows GW to release a game that doesn't require long time support. The latter in particular seems like a smart decision from GW, their three main games are a big enough challenge right now anyway. I do have mixed feelings about the limited edition-approach, in particular as I already forsee GW magically finding another warhouse full of boxes if the sales are good (which happend last time with Space Hulk). Secondly the GW store makes it clear that ordering prior to a specific date will garantee you a copy, so rather than a fixed number of boxed sets it appears we are looking at a time-based release with a second run, depending on initial sales/demand. Which of course makes a lot of sense, but why don't they simply say so. GW does seem to have quite a bit of difficulty communicating with both their own stores and the consumer base. 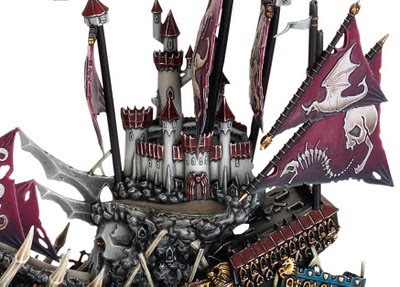 Eventhough I've more or less stopped supporting GW I am impressed by the visual details of this release, but the utter lack of info on gameplay mechanics make it a 'no buy' for me I'm afraid. I understand GW has enough stuff going on to want to keep a new game strong enough to stand on it own and that pushing the 'limited edition' thing helps to create buzz. But as a young guy with decent income and cash left to spend at the end of the month, I still want to know if this stand alone game will be any actual fun. In the end though it doesn't really seem to matter as I just heard from a friend he bought a copy for us to try out. The two of us have been getting back into some old and new boardgaming and I got him Star Trek Expiditions a will back (which was a lot more fun than we'd anticipated). So looks like I'll be forced to try this one out and let you all know if it actually is fun or not! Thanks for the review on this game. The idea of purchasing it has been tossed around with my gaming buddies and most everybody seems to agree with you... No go. I'm going to pass this review on to them and see what everybody thinks. $115 (USD) is very steep to me and the "Limited Edition" is enough to make me say no. Thanks again for the review. My absolute pleasure, though it certainly helps that Games Workshop has picked up on their Dreadfleet blogging. Quite a lot of info has passed by this week and I'm slowly getting a feel for the game. As soon as the box arrives I'll gladly go delve into the rules, scenarios etc to provide more info to my fellow blogspherians!